Indian Space Research Organisation (ISRO) has postponed Chandrayaan-2, India’s second mission to Moon to January 2019. This will be the second time the mission has been postponed. The ambitious mission was earlier planned to be launched in April 2018 and was later fixed for October 2019. With this delay, India may lose fourth position in the world for soft-landing on the Moon to Israel as it too is planning to launch a Moon mission in December 2018. Chandrayaan-2 is India’s most challenging and India’s second mission to Moon. It is an advanced version of the previous Chandrayaan-1 mission (launched in 2008) which only involved orbiting around Moon, Chandrayaan-2 is a much complicated mission as it involves an orbiter, lander and rover. The mission components have been completely developed indigenously by ISRO and consists of Orbiter, Lander and Rover configuration. In this mission, ISRO will for the first time attempt to land a rover on Moon’s south-pole. The mission involves soft-landing on the lunar surface and the rover will walk and analyze the content on the Moon’s surface. 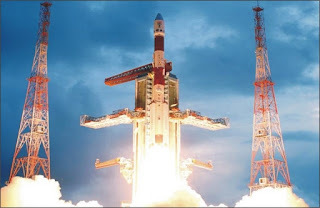 Chandrayaan 2 will be launched on board of Geosynchronous Satellite Launch Vehicle Mk III (GSLV-F10). It will be ISRO’s first inter-planetary mission to land a rover on any celestial body. The spacecraft (orbiter) weighs around 3,290 kg and it will orbit around Moon and perform objectives of remote sensing the Moon. Once GSLV-F10 put the spacecraft in 170 km x 20,000 km elliptical orbit, the orbiter will be manoeuvred towards the 100-km lunar orbit by firing thrusters and then the lander housing the rover will separate from the orbiter. The six wheeled rover will move on an unexplored lunar surface and collect soil or rock samples for on-site chemical analysis to gather scientific information on lunar topography, mineralogy, elemental abundance, lunar exosphere and signatures of hydroxyl and water-ice. The data will be relayed to Earth through the orbiter. The rover will move around the landing site in semi-autonomous mode as decided by the ground commands. The soft-landing on the surface of the Moon will be the most complex part of Chandrayaan 2 mission. Only US, Russia and China have been able to soft-land a spacecraft on the lunar surface. Q1. Indian Space Research Organisation (ISRO) has postponed Chandrayaan-2, India’s second mission to Moon to? Q2. How many countries have been able to soft-land a spacecraft on the lunar surface so far?